Like most of the people that I knew in high school, The Counter has lost its appeal and grown fat, lazy, and bland. Have it your way....provided that "your way" is a crappy cheeseburger. Today, Colonel Mustard, Side Of Fries, and I went back to The Counter to revisit what we recalled as a damn, fine cheeseburger. It was like going back to hook up with an ex--about an hour into it you realize all the reasons that you broke up, and you discover new ones. Ready...Set...Terrible! 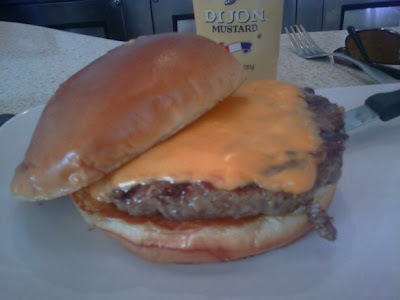 I ordered my burger 1/3 lb, Med Rare, plain "hamburger" bun, and a slice of American cheese. 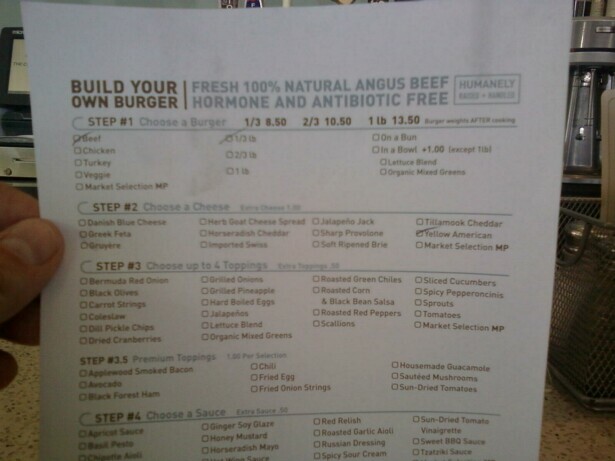 I used the handy, "foolproof," ordering system, where one is required to specify the burger parameters, in writing, and hand it into a server for prep and delivery. 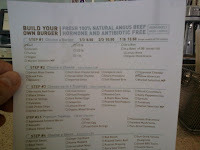 This menu promised the beef to be antibiotic and hormone free--the special surprise was that it would also be flavor-free and texture-free, but I have gotten ahead of myself. Mine showed up with Swiss--I sent it back. It came back moments later, and by "it" I mean the same, freaking patty. First, I noticed that the plate was a mess--there were bits of food and liquid on the plate, which seemed to have nothing to do with my cheeseburger. This time the cheese was barely melted, and I noticed a bit of melted Swiss on the bottom bun....hmmm. I peeled back the unmelted, American cheese slice to reveal thin lines of Swiss cheese, which indicated that someone had used their fingertips to scrape off the Swiss cheese from the patty and put a cold piece of American on top of it. GROSS. I sent this one back, too. It was a douchetastic, shockingly lazy, and sloppy move by an incompetent kitchen staff that had no concept of quality. After a few more minutes, the burger that I ordered showed up....I guess...I mean, who could know after the last thing that happened. The satisfying and tasty char of a year ago--non-existent. The cool grill barely got any color onto the beef. The beef--an oil slick of Deepwater Horizon Blowout proportions-- 75:25 chuck(?) with the texture of baby food--it was a pink, oily, meat paste due to the fine grind and greasy, greasy beef. It was completely bland in terms of both texture and flavor The grease in the beef probably explained the lack of sear or substantial grill marks. Any real heat on that lard bomb, and the fire department would have set up shop at The Counter. The Seasoning--there was only a tiny hint on the outside--this coupled with the fact that they didn't add seasoning to the ground Angus that made up this burger meant that there was not a hint of savory and/or umami flavor to be found. The American cheese--it was lost in the blandness of the beef. The Bun--The Counter recently changed suppliers, and the new "hamburger" bun resembled flimsy challah. It was overly sweet with a cake-like texture, which turned into a sloppy, wet mess when it soaked up the grease and juice from the burger. 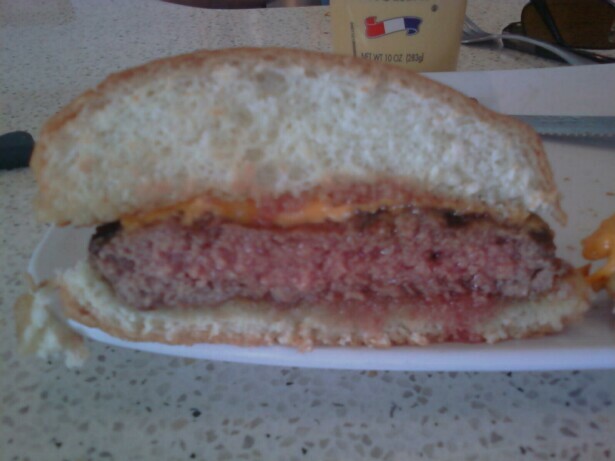 Imagine a school lunch roll dipped in warm, oily water--it was a useless way to hold the already greasy burger. The fine, wet texture served to showcase the already pasty mouth feel of the meat. 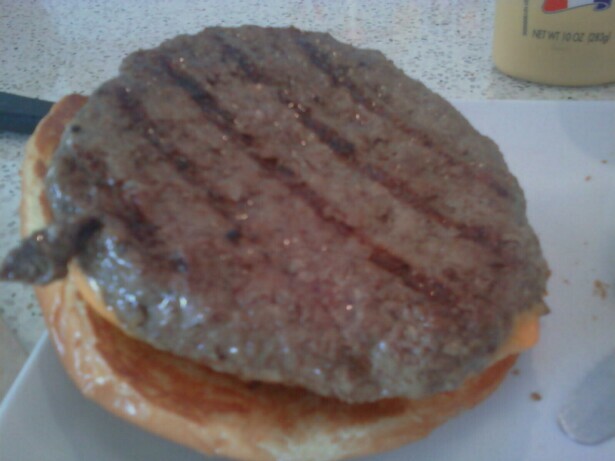 The overbearing sweetness of the bun further pointed out lack of seasoning in and on the patty. Meat:Bun Ratio--The greasy, wet meat overwhelmed the weak bun and soaked right through. This pushed the dish over the edge from Pretty Damn Awful to Sad Pile Of FAIL. The par-cooked fries were the best thing that we tried, and they showed up 10 minutes before the burgers and 15 minutes before my burger arrived as ordered. The Value: On the plus side, they acknowledged the preparation blunder and comped my burger. On the minus side--I could only eat half of it, because it was mealy, wet, bland, and greasy--unpleasant. At a price of $0, this was still a bad value. At a nearly $7 price tag, the value was awful. It was clear that The Counter has failed to manage its standards while increasing the number of its locations via a franchising strategy. The Counter being a franchising operation is really a real estate company that happens to help its clients pay their rent and dues by purveying crappy food to the public. It has become an overpriced McDonalds without the toys or the quality control. Burger Review : If you remember The Counter when it was good, don't go back. If you have never been to The Counter, don't go.